Neuromarketing researcher Christophe Morin reveals how to mix emotions to serve sales. An interview with Stephen M.R. Covey Big things come from small gestures. That’s part of the message Stephen M.R. Covey conveys to business leaders all over the world. In Part 2 of an interview with Publisher Paul Feldman, Covey explains how the details make the difference in winning clients’ trust. An interview with Stephen M.R. Covey Trust is the one thing that changes everything in business, says Stephen M.R. Covey. But trust isn’t built overnight. In this interview with Publisher Paul Feldman, Covey describes the value of trust in relationships and lays out the path for creating behaviors that build trustbased interactions. An interview with Tom Hegna Tom Hegna built a career on creating happy retirements for clients. 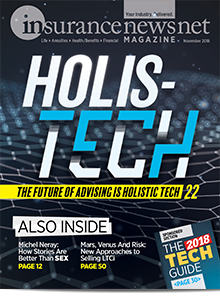 In this interview with Publisher Paul Feldman, Hegna explains why an advisor who claims to uphold the highest standard of care but ignores annuities is doing a disservice to clients. Tom Hegna is on a mission to help save retirement, and he wants you to warn clients of their retirement risks. 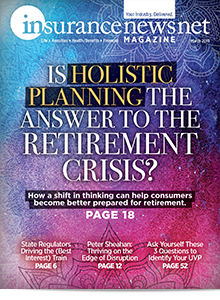 Hegna, the industry’s leading retirement expert, tells Publisher Paul Feldman that advisors who are not talking about insurance to protect their clients’ retirement are not looking after their clients’ best interests. Patrick Bet-David is rejuvenating recruitment by bringing new people to selling success. Can He Make Insurance Cool? Is Everything You Know About Leadership Just BS? An interview with Jeffrey Pfeffer There’s a big difference between what leaders say they do and what they actually do. Jeffrey Pfeffer, author of Leadership BS, tells InsuranceNewsNet Publisher Paul Feldman what’s wrong with leadership today and how to build strong, authentic leaders. An interview with Whitney Johnson Success doesn’t always follow a straight line. Whitney Johnson says the road to success looks more like an S curve. Johnson, author of Disrupt Yourself, tells InsuranceNewsNet Publisher Paul Feldman why making your way through the S curve of disruption can be tough but financially rewarding in the end. An interview with Marshall Goldsmith When the world’s top CEOs need help staying on track, they call on Marshall Goldsmith. Goldsmith has made a career out of coaching the best in the business. In this interview with InsuranceNewsNet Publisher Paul Feldman, Goldsmith describes how to combat the triggers that prevent us from doing the things we know we should be doing. An interview with Pascal Finette Is it really easier to 10X your business than it is to increase it 10 percent? Pascal Finette thinks so. This early Internet pioneer made a name for himself by riding disruptive change to even greater heights. He tells InsuranceNewsNet Publisher Paul Feldman how anyone can rocket their business to spectacular success. An interview with Jeremiah Desmarais Digital marketing is transforming the way advisors do business. But how do you get started? Jeremiah Desmarais has helped more than 100,000 agents see results in the digital marketing space. Jeremiah tells Publisher Paul Feldman how you can use digital marketing to see spectacular sales results. Dan Seidman shows how FBI training can help you see what people are really thinking. An interview with Maribeth Kuzmeski Going big doesn’t necessarily mean going bigger. As Maribeth Kuzmeski explained to InsuranceNewsNet Publisher Paul Feldman, focusing your practice on a narrower niche often can be the key to expanding your practice even further. Marketing legend Dan Kennedy unlocks the door to the high-net-worth market. In this interview with InsuranceNewsNet Publisher Paul Feldman, Jay sketches out the roadmap that will lead you to achieving preeminence. In this interview with publisher Paul Feldman, Chris Bailey discusses his yearlong quest to uncover the most effective ways to be productive. Amy Morin learned through tragedy the 13 things that the mentally strong do not do. How to have amazing conversations with anyone. An interview with Judith Glaser by Paul Feldman, Publisher. In this interview with publisher Paul Feldman, Terri Sjodin shows how an attitude adjustment will solve sales problems and bring in the big deals. In this interview with InsuranceNewsNet Publisher Paul Feldman, Hoffeld explains how you can tap into this science and guide your prospect to saying yes. An interview with Stu Heinecke Getting past the gatekeeper is one of the biggest challenges faced by anyone in sales. Stu Heinecke, author of How to Get a Meeting With Anyone, tells InsuranceNewsNet Publisher Paul Feldman how the right use of humor can open the gate. Marv Feldman followed up his successful life insurance sales career with a new mission and a greater sales pitch – to inform the American people about the importance of life insurance. Laura Stack shows executives and business owners how to stop squandering time and resources on the wrong things, and how to set the right things right. Buyers are motivated by one of two things: pain or gain. How do you use that motivation to your benefit? Dan Seidman, author of The Ultimate Guide to Sales Training, explores how to differentiate the two types of buyers and use their motivation as part of a larger sales process. Pain vs. Gain: What Best Motivates Buyers to Buy? Dan Seidman, author of The Ultimate Guide To Sales Training, discusses how to tell the difference between pain-motivated and gain motivated buyers, and how to tailor your presentation to each. We all have a superpower. But how will the rest of the world ever know what it is if you don’t show it? Amy Cuddy has made a career of studying body language, and her best-selling book Presence describes the effect that Power Posing has on ourselves and others. In an interview with InsuranceNewsNet Publisher Paul Feldman, Amy teaches how striking the right pose can help us become our authentic selves. An interview with Gino Wickman – Part 2 Every business owner knows the frustration of putting more effort into the business yet going nowhere. Gino Wickman, author of Traction, has the solution to pull you out of the mud. In Part 2 of his interview with InsuranceNewsNet Publisher Paul Feldman, Gino describes how seeing your business using a very short view and a very long view will keep you on the road to success. An interview with Gino Wickman When the visionary who creates and grows the business meets up with the integrator who helps put those visions into action, the results are explosive. That’s according to Gino Wickman, author of . Gino tells InsuranceNewsNet Publisher Paul Feldman why every visionary needs an integrator and how to make that match. An interview with Chet Holmes Everyone needs a “stadium pitch,” a strategy for attracting clients faster and in greater numbers. That is one of the nuggets of sales wisdom from Chet Holmes, author of The Ultimate Sales Machine. In this interview with InsuranceNewsNet Publisher Paul Feldman, Holmes describes his method for cutting through the clutter and motivating your audience to buy. An interview with Todd Cohen Who is on your company’s sales team? Everyone! Even if sales isn’t part of an employee’s job description, every person in your operation has an impact on the customer’s decision to buy. Marketing and advertising remain stuck in the 1950s, according to Dan Kennedy. Known as the Professor of Harsh Reality, Kennedy is famous for his blunt but rock-solid advice on what does and does not work in the way of marketing. 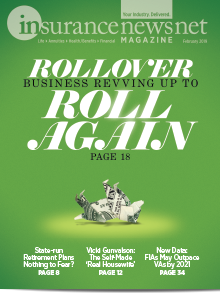 In an interview with InsuranceNewsNet Publisher Paul Feldman, Kennedy describes how to shake up your marketing efforts and dazzle your prospects. Robert A. Kerzner, president and CEO of LIMRA, is in the unique position of knowing carriers, Producers and researchers. In this interview with InsuranceNewsNet Publisher Paul Feldman, Bob discusses the main disrupters for the life insurance industry and how to turn them into positives for companies and producers. The most influential salespeople don’t just present material to their audience. They entertain and engage their audience. Dave VanHoose is a master of what he calls “presentainment.” In an interview with InsuranceNewsNet Publisher Paul Feldman, Dave describes how to craft entertaining presentations that close more business. An interview with Nick Nanton What if you were so famous that you could make sales without having to appear in person? Emmy Awardwinning filmmaker Nick Nanton tells InsuranceNewsNet Publisher Paul Feldman how to market your practice in such a way that you become a celebrity in your own community. In this interview with InsuranceNewsNet Publisher Paul Feldman, Kuzmeski gives the details on how you can craft your own playbook and become Most Valuable Player to your clients. An interview with Joseph F. Coughlin. 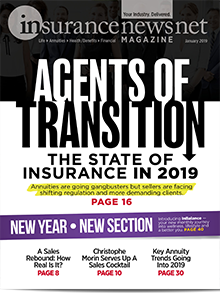 In this interview with InsuranceNewsNet Publisher Paul Feldman, Coughlin describes how the agent of the future will guide clients into a new type of retirement. An interview with Paul Stoltz Science has tried for hundreds of years to figure out the magic formula for success. Paul Stoltz has boiled it down to one word — GRIT. 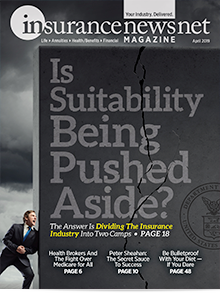 In this interview with InsuranceNewsNet Publisher Paul Feldman, Stoltz tells how Growth, Resilience, Instinct and Tenacity combine to make anyone a top performer in their field. An interview with Frank Kern He’s the self-proclaimed “King of the Internet,” having sold millions of dollars’ worth of products and services online. Frank Kern is convinced that the reason advisors don’t land “whale” clients is because they use minnow bait in a minnow pond. In an interview with InsuranceNewsNet Publisher Paul Feldman, Kern gives his secrets for attracting bigger clients so you can spend less time chasing small clients. Web research tools have made cold calls a thing of the past, according to Sam Richter, author of Take the Cold Out of Cold Calling. Speaker, actor and former NFL standout Bo Eason, in the second part of his interview with InsuranceNewsNet Publisher Paul Feldman, describes how he takes command to create a compelling presentation. It takes a tough guy to get tender with a personal story, and former NFL player Bo Eason is just the man to do it. What goes into making a good impression? It's not only looking your best, it's sounding your best as well. How to be your best when you’re in the media spotlight. Paul Feldman interviews Brad Phillips. John Jantsch says salespeople are dooming their careers with tired, outmoded practices, but Duct Tape Selling can save the day! He's perhaps the most famous copywriter you've never heard of. John Carlton made his mark by creating killer ads for his clients. In this interview with InsuranceNewsNet Publisher Paul Feldman, Carlton describes how to break down the process of creating advertising that gets your prospect's attention. You wouldn’t use an axe to pound a nail into a two-by-four and you wouldn’t use a hammer to chop firewood. Dealing with people is no different – you need the right tools. In this interview with InsuranceNewsNet Publisher Paul Feldman, Alan C. Fox, author of People Tools, shares his secrets for cultivating business and personal relationships. An interview with Tony Jeary Being successful in sales means being a successful presenter. Tony Jeary, presentation strategist and coach for companies such as New York Life, knows the secrets to a successful presentation. In this interview with InsuranceNewsNet Publisher Paul Feldman, Jeary describes how engaging your audience is the key to making an unforgettable presentation. A brand is the glue that holds the rest of your marketing efforts together. That is one of the lessons taught by Al Ries, who has spent the past 40 years helping companies large and small to refocus their branding. In this interview with InsuranceNewsNet Publisher Paul Feldman, Ries gives you some ideas on how you can be first in your prospect’s mind. Most of us are familiar with the Pareto Principle, which states that 80 percent of your business is generated by 20 percent of your activity. Duncan MacPherson and David Miller built Pareto Systems to help individuals and businesses use that principle to propel them to success. In this interview with InsuranceNewsNet Publisher Paul Feldman, Duncan MacPherson discusses the principles that can help you make 2014 your best year ever. Michael Levin may have had nine books on the best-seller list, but he knows that selling a lot of books isn’t the only way to measure your success as an author. In his opinion, a book is one of the best marketing tools around. In Part 2 of his interview with InsuranceNewsNet Publisher Paul Feldman, Levin describes how writing your book can turn you into the “go-to” person in your community for your line of business. Interview with Michael Levin. Even in this fast, cynical digital age, one kind of person still commands respect. The title itself carries gravitas: author. You have a story to tell and information to convey to your clients and prospects. How do you get that message across and position yourself as an expert? By putting content marketing to work for you! In an interview with InsuranceNewsNet Publisher Paul Feldman, the author of Epic Content Marketing, Joe Pulizzi, shares the concept of content marketing and provides a strategy on how to become your own publisher. 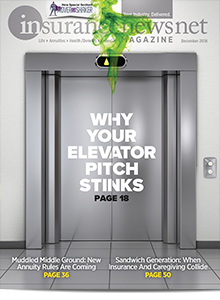 Terri Sjodin Interview: We’ve all heard the term “elevator pitch,” that mini-speech designed to grab someone’s attention, tell them what you do and get them interested in your services – all in the time it takes to ride in an elevator. The motivational speaker, talk show host and author challenges his audience to examine whether they are giving and getting all they can from life. In this interview with InsuranceNewsNet publisher Paul Feldman, Les Brown discusses how his own personal challenges inspired him to attain what he calls his "magnificent obsession." Do you want to sell without being a salesperson? Do you want to market your business without using marketing? Are you sick of networking and using social media without getting the results you want? Scott Stratten has the answers for you! In this interview with InsuranceNewsNet publisher Paul Feldman, Stratten gives the secrets of "UnMarketing" and tells you how to position your business naturally and automatically. A military fighter pilot turned motivational speaker, Rob “Waldo” Waldman has taken the lessons he learned from flying an F-16 jet in combat and is sharing them with the business world. In this interview with InsuranceNewsNet Publisher Paul Feldman, Waldman describes why you need to surround yourself with “wingmen” who will help you to reach new heights in your career and your life. The man described as “the greatest marketing mind alive today,” Jay Abraham, wants each of us to achieve preeminence. In this interview with InsuranceNewsNet publisher Paul Feldman, Abraham describes how just a few small changes in your normal way of doing business can catapult you to preeminence. Too many of us are content to live in mediocrity, but Jay Abraham, marketing master and author of Getting Everything You Can Out of All You’ve Got, knows that there is greatness inside of everyone. In this interview with InsuranceNewsNet publisher Paul Feldman, Abraham describes the four steps of greatness and why they are worth attaining. Are you a Victor or a Maestro? And what do they mean anyway? Sally Hogshead, author of Fascinate: Your 7 Triggers to Persuasion and Captivation, explains the different ways in which the world perceives you and how you can use your strengths to grab your client’s attention. Carmine Gallo is the communications coach for the world’s most admired global brands – including Apple, Coca-Cola and Intel. He talks with InsuranceNewsNet’s publisher, Paul Feldman, about his work with former Apple co-founder Steve Jobs and how you can become a master of the art of presentation. An interview with Joseph Sugarman One of America’s top advertising and marketing entrepreneurs, Joseph Sugarman, the man behind those BluBlocker sunglasses, and many other successful businesses, talks with InsuranceNewsNet’s publisher, Paul Feldman. New York Times best-selling author of 15 Invaluable Laws of Leadership and more than 60 other books, John Maxwell continues the dialogue of mastering, and passing on, leadership skills from one of his best-known books, The 5 Levels of Leadership. Author of The 21 Irrefutable Laws of Leadership and a New York Times best-selling author of more than 60 books, John Maxwell discusses how personal growth must be mastered, and maintained, before effective, true leadership can develop. Author and co-author of six books, Jim Collins is obsessed with finding out the hows and whys of great companies and their enduring success. New York Times-bestselling author Brendon Burchard discusses how to engage the 10 human drives that manifest fulfillment and happiness in our work and personal lives. Jon Goldman reveals his “magic formula” that helps maintain balance between working in your business and working on your business. Sullivan explains why you can’t do really great things without breaking free from what you’re currently doing and start thinking bigger—10x bigger. Cialdini describes how insurance producers can apply his six principles to be masters of influence in order to move clients to make decisions faster. I am writing this on an Amtrak train on my way back New York City, still in shock after the min Editorial & Design Awards ceremony. Harvey discusses how persistence and integrity – two critical aspects to finding success in the insurance business – still win the day, even in our nanosecond world. If you want better results from your marketing, it’s time to get OUTRAGEOUS! Harvey Mackay, the man who taught you how to Swim With the Sharks Without Being Eaten Alive, is back to show you how to be so indispensable to your clients you’ll never lose one again. Did you know you have three brains? So do your clients and if you are not talking to the decision-making brain, you are wasting your time and marketing. Janet Switzer wrote the book on Instant Income and how any company can start generating cash now. Producers can learn how they can (almost) immediately turn on the tap by using the secrets Switzer shares in an interview with Publisher Paul Feldman. Tap into the power of Neil Fiore’s Now Habit to ignite productivity by simply changing your perspective. Jay Levinson was part of some of the most recognizable campaigns in advertising history, such as the Marlboro Man and the Pillsbury Doughboy. Then he shared his marketing smarts with the little guy and the revolution began! In this interview with Publisher Paul Feldman, Brian Tracy tells how the truly successful often started from nothing and reveals how to do it. Renowned executive coach Jay Abraham helps producers bring out success by uncovering hidden assets, overlooked opportunities, and undervalued possibilities.